From the earliest centuries of our era, the region of Amaravati in Andhra Pradesh in the Southern Deccan was a flourishing Buddhist centre that witnessed the development of a highly original art. Despite some subtle foreign influences, this work remains fundamentally Indian. 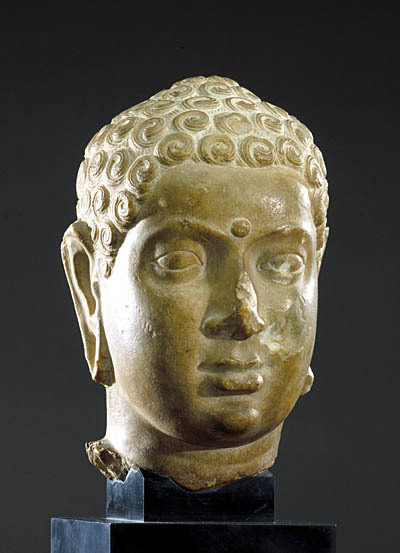 The elongated face recalls certain specifically Dravidian features: the earlobes are distended, the urna-a distinctive mark of the Buddha, always placed at the junction of the eyebrows-is conspicuous, as is the usnisa. The latter small protuberance on the upper head can be seen rising beneath the hair which is treated in regular, stylized curls ritually spiralling to the right. Figurative representations of the Buddha only appeared in the Amaravati school from the 2nd century; up till then there had solely been symbolic references. Occasionally, a foreign- and, more specifically, Romano-Alexandrine- influence can be detected in the production of the Amaravati school and is clearly expressed in this sculpture with its emphatic realism and expressivity. The great French Orientalist René Gousset described the piece as virtually a “Statue-Portrait of Ancient Rome“. Such influences can be explained by the historically attested maritime contacts and trading relationships between the east coast of India and the Mediterranean basin during the first two centuries of our era. Numerous fragments of pottery from Arezzo (Latium) and Roman coins from the age of Augustus and Claudius have been discovered along the southeastern seabord of India. One such coin has been, moreover, discovered at the very spot where the head was unearthed. The iconographical type of Buddha as defined by the Amaravati school between the second and third centuries AD was to gradually establish itself, spreading as far as the Indianized kingdoms of South East Asia.